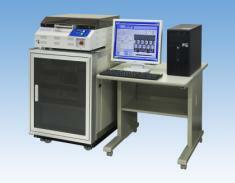 [512 pins latch-up tester Model 7600L] The Model 7600L is a latchup and DC tester with maximum of 512 pins. The condition of device pins can be programed by relay switch matrix. Programming and operation is very easy providing the stable latchup test results. This model enable the latch-up test based on a standard as well as DC parameter test. This model only conducts DC test which measures very low leakage current measurement up to ICC or IDD power supply current. ｜　Copyright2007 TET Co., Ltd.